Some studies have demonstrated that a simple parallel connection of an ultracapacitor to a low-cost alkaline battery can duplicate the performance characteristics of a lithium-ion battery. Now on the market is an ultracapacitor kit for forklifts using lead acid for the energy density storage and Ioxus ultracapacitors for the power density. Ioxus Ultracapacitors. Click image for the largest view. Better yet in many applications, the use of ultracapacitors to provide peak power will extend battery life by a factor of four and in some cases even more. That kind of improvement will have a dramatic effect on the recycling and waste disposal problem associated with the batteries being used every day in portable and hand-held devices on up to the largest lead acid or nickel cadmium sets. Ioxus is calling their product an ELCD Electronic Reservoir System or EERS. In the forklift design each module is a set of 60 ultracapacitors, control electronics, safety circuitry, the interconnects and a safety enclosure. The customer gets a complete stand-alone power assist module. The kit offers such a boost those electric lifts in cold warehousing situations can run all day. The kit installs in about an hour. The effect is that the battery set can run 30% longer and avoids a deep discharge, an enemy to lead acid cells life expectancy. If not in a deep freeze ware house customers can reduce the total battery set size by 15% or so. The instructive value here is that forklifts draw minor power when moving about but deeply need power when lifting heavy loads. That is when the ultracapacitor set kicks in, supply the electrons in a rush while the battery chemistry is steadily discharging away oblivious to the sudden draw down of power. This gets more interesting when considering a regenerative braking system. The charging effect is magnified in a fast braking effort. A lot of energy is suddenly loaded into a system – a reverse of the discharge. As readers know, the battery chemistries don’t like those fast charges and discharges. The Ioxus design does just what is needed for those fast cycles. 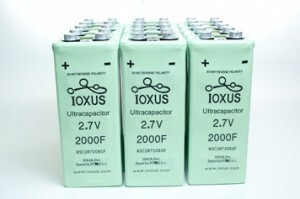 With orders in hand Ioxus has cracked an interesting market by bringing the special characteristics of ultracapacitors to a product. Leading the marketing was the ultracapacitor’s wide temperature range, so exploiting the difficulties of electric drive sets in cold locations such as the refrigerated warehouse. The Ioxus design also uses the low resistance to gather back the energy from lowering a load taking up a lot of current in a very short time frame. The company is also simplifying the packaging with multiple cells wired so that most any voltage requirement can be satisfied. Until something like EEStor gets market penetration, which might be delayed by setting their price too high, there will be for years or decades to come a huge number of battery powered devices in need of an efficiency update. Ultracapacitors essentially offer moving and holding a charge and ions. Unlike a battery the chemical bonds need not be made and broken for an energy absorption or release. That aspect and the leveling of a charge or discharge rate extend battery life giving a lot more things than first though a new lease of a useful life. Ioxus makes carbon-carbon ultracapacitors where both electrodes are carbon, as opposed to the hybrid (asymmetric) ultracapacitors in which in one of the electrodes is carbon and the other electrode utilizes a different material. Energy densities of hybrid ultracapacitors can be significantly greater than that of carbon-carbon ultracapacitors, but power densities are lower. Thus the company made a choice, leave the density to a cheap battery and the fast moving electrons to an ultracapacitor. They seem to be going the wrong way, but Ioxus has customers and real world results on existing equipment. Maybe they are going exactly the right way. But Ioxus isn’t slack in the research and technology area. To achieve its power densities Ioxus is essentially using multiple types of carbon to pack the material as best as possible and using a variety of different types of carbon with different conductive properties. Ioxus has also optimized binders to adhere to special foils inside the canisters. They are making the typical cylinders as well as prismatic shapes. Ioxus has 12 patents to date with others in proceedings or preparation. Like everyone in the business they are interested in transportation applications—mass transit, hybrid-electric, train/light rail, and stop/start applications. Where Ioxus is different is the applications closer to the load such as replacing power steering with electric steering using ultracapacitors, smart airbags, instrument clusters, multimedia/telematics, seatbelt releases, and power seats, locks and windows – all short term high current loads. They might even consider the air conditioning matter, one that was sure to bedraggle the electric powered car for years to come. One hopes they see the opportunity in the overnight chargers as well. The opportunities seem boundless today, with the EEStor product perhaps being the one market gorilla in the future. But there is a lot of things holding the EEStor project back, the license terms seem strange, the investors are sure to try for ubar billionaire status from the breakthrough so reducing the EEStor effect and delaying the growth in return for the big bucks. Somehow this writer doesn’t see EEStor being so shrewd as to go to the lowest cost maximum volume as fast as possible. That makes the Ioxus business very attractive. Not just for the existing fleet where the technology can be installed quick and cheap, but for new equipment as well. The problem of energy density and power density offers consumers a great opportunity with innovation such as Ioxus is offering. You can have both. Now – with no waiting for the EEStor products and if EEStor tries over pricing, who cares? Better yet in many applications, the use of ultracapacitors to provide peak power will extend battery life by a factor of four and in some cases even more. If the life extension factor is true, I would say that the equipment is: 1. poorly designed; 2. designed before supercapacitors were available (they have been around for a number of years now); 3. has some other constraint of cost, size or weight so that sacrificing battery life makes sense. Nothing really new here. I was not aware of this particular manufacturer, but no doubt would have found them quickly had I reason to do a search. Really nice information, Can you provide more information on this?